Many people talk about the ferocious and extreme weather that roams across the surface of our humble planet, and they’re right; it can be quite destructive and awe-inspiring. However, our so-called storms pale in comparison to the cataclysmic cyclones that tear through the dense atmospheres of the gas giants or roam the surface of Mars. Thanks to advanced satellite imagery and some arduous journeys across the solar system, astronomers have been able to observe and study the ferocious hurricanes that emerge out of the swirling atmospheres, capturing breathtaking images and forever expanding on our knowledge of these incredible planets. When you think of hurricanes in space, your mind will immediately be drawn to Jupiter’s mighty Great Red Spot, and rightly so; that storm is monumental. Jupiter’s atmosphere is plagued with hundreds of storms in a plethora of sizes. However, it’s Saturn’s cloud exterior that is infinitely more fascinating and visually stunning. One of the most iconic images of Saturn is the Great White Spot, which is a storm raging across its upper atmosphere, leaving a path of destruction behind it. Although it may seem impossible, there is another, more stunning image—Saturn’s north pole vortex. Trapped inside a perplexing, hexagonal cloud formation (which we will talk about later) and featuring an eye that spans 2,010 kilometers (1,250 mi), this beautiful hurricane generates wind speeds of over 540 kilometers per hour (330 mph). The breathtaking image above was taken by the Cassini mission back in 2013 after it had been orbiting the gas giant for several years and is just one of many incredible photographs from the highly successful mission. During a mission to Earth’s sister planet back in 2006, the European Space Agency’s Venus Express satellite observed what appeared to be a cyclone whirling away above Venus’s south pole. 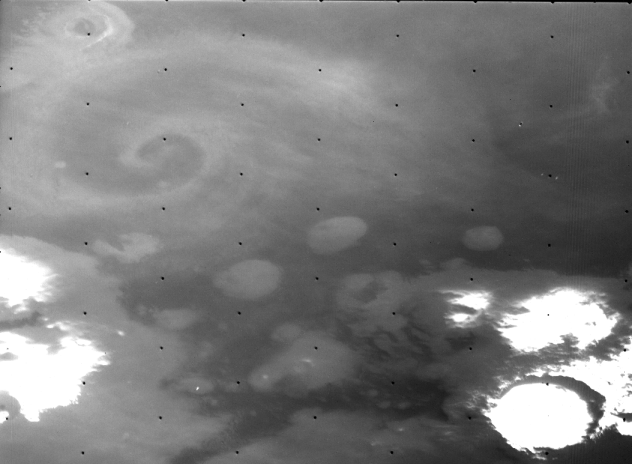 What’s also fascinating is that a similar storm was observed over Venus’s north pole in 1979 by NASA’s Pioneer mission. The storm over the south pole is four times larger than anything seen on Earth and measures a whopping 20 kilometers (12 mi) in height. (That’s over twice the height of Mt. Everest.) Assuming you were somehow indestructible and could survive standing beneath the clouds at Venus’s south pole, you would feel no rain or wind from this incredible storm. This is because the cyclone sits at 42 kilometers (26 mi) above the Venusian surface, and due to the planet’s insane heat, rain can only get to within 35 kilometers (22 mi) from the ground before it is evaporated. So, instead of being drowned or destroyed by this cataclysmic cyclone, all you would see are giant, whirling clouds high above your head. 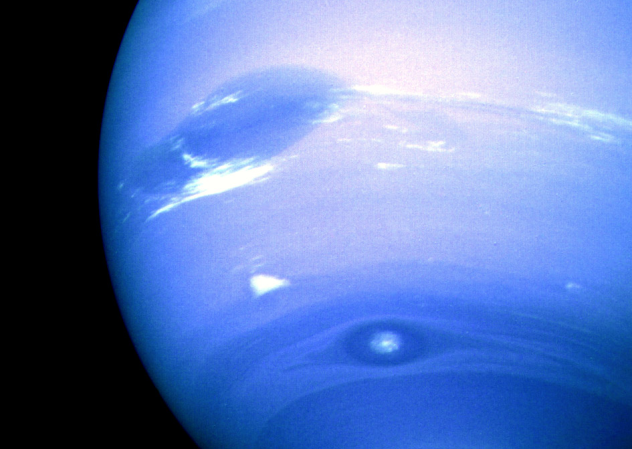 Like a teenager, Neptune’s surface is occasionally plagued with Great Dark Spots (GDS). First observed in 1989 by NASA’s Voyager 2 space probe, the first GDS was a cyclone the size of Earth raging in Neptune’s southern hemisphere with winds of 2,400 kilometers per hour (1,500 mph), the fastest winds recorded in the solar system to date. Unlike some extraterrestrial storms, Great Dark Spots are not permanent, as the Hubble Telescope observed in 1994 when it simply couldn’t find the fabled GDS that Voyager 2 had snapped. However, all was not lost, as Hubble did observe a separate GDS on Neptune. This time, it was in the northern hemisphere. These storms are somewhat perplexing, as they travel in the opposite direction of Neptune’s axial spin. Similar to other cyclones, these “spots” are caused by large temperature gradients through the planet’s atmospheres, but the ridiculously high wind speeds found on Neptune have yet to be explained. Located in the southern hemisphere, deep within Storm Alley (clearly the coolest of all alleys), lies the devastating Dragon Storm. Photographed by the Cassini mission in 2004, this amazing thunderstorm spans over 3,200 kilometers (2,000 mi) (bigger than the continental United States) and produces lightning bolts 1,000 times more powerful than those seen on Earth. These lightning bolts haven’t been directly observed but instead were detected from intense radio signals. Cassini wasn’t the first to observe the storm, though, as both of the Voyager spacecrafts also picked up intense radio noise when above the Storm Alley, meaning this storm has been constantly brewing beneath Saturn’s atmosphere, occasionally flaring up in a dramatic thunderstorm. As well as these spectacular images, Cassini also observed several dark spots coming out of the Storm Alley as the Dragon Storm was flaring up. These spots traversed across Saturn’s surface, either merging together or dissipating into the atmosphere. Both outcomes show that intense storms feed the intense atmospheric features found on the gas giants, maintaining the immense currents and generating the stunning cloud displays that we observe today. In 1999, a colossal storm was observed above the Martian polar ice caps. Despite being over four times the size of Texas and engulfing the entirety of the Martian north pole, it only lasted for one Earth day before dissipating entirely. Storms like this are rare on Mars, but they have been caught on camera before, once in 1978 by Viking I, though they were not as big as those seen by Hubble. The storm detected by Hubble is thought to have contained at least three bands of clouds wrapped counterclockwise in a spiral structure and orbiting a hurricane-style eye the size of Lake Ontario. Both of the observed storms on Mars occurred during middle of the Martian northern hemisphere’s summer season. This is a key time for Mars, as its seasonal carbon dioxide polar cap has completely sublimated (melted) away, leaving a frozen water cap behind. Similar storms that are found over Mars’s polar ice caps occur right here in our own polar regions; some are even comparable in size. Titan is Saturn’s largest moon, and in terms of weather, it is one of the most intriguing moons in our solar system. With a thick atmosphere composed almost entirely of nitrogen with a bit of methane, it almost resembles that of Earth’s, if you ignore the fact that it’s totally impossible to breathe on the surface. Titan is riddled with methane rivers and lakes overseen by majestic mountains and surrounded by dunes. It’s these dunes that have conjured up a bit of mystery for astronomers. 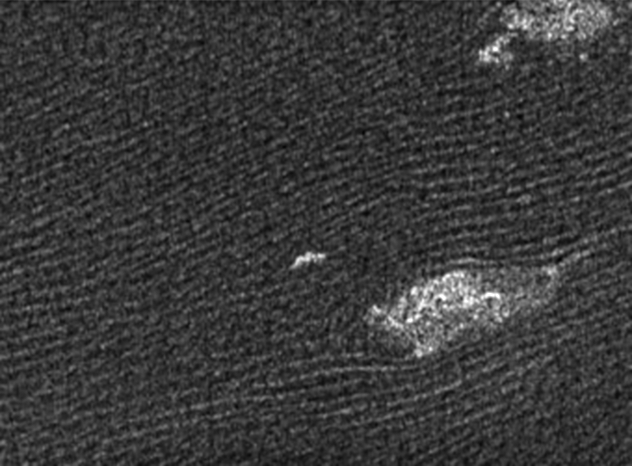 Simulations of Titan’s surface winds all agree that Titan’s dunes should point to the west, yet they face eastward. Some suggest that Saturn’s intense gravitational tides cause the winds to turn, but that still doesn’t explain why they face east. Spanning two-thirds of Earth’s diameter and hovering 32 kilometers (20 mi) above Saturn’s south pole, this humongous vortex bears an uncanny resemblance to a dark, mysterious eye. While this storm might just look like a typical, albeit bigger, hurricane, its behavior is distinctly unlike a hurricane. 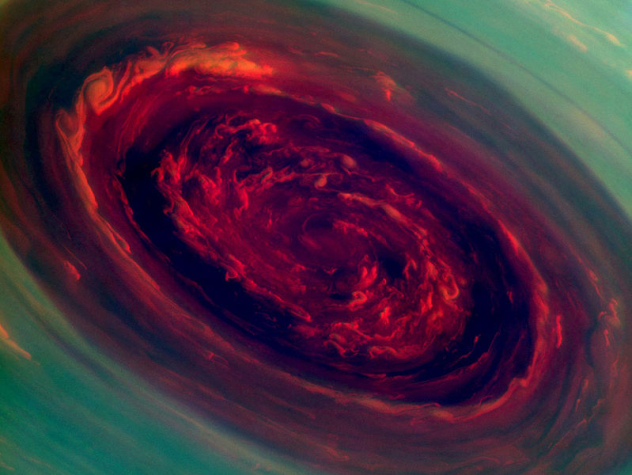 As numerous Floridian weather reports will point out, hurricanes on Earth drift across the ocean, but on Saturn, this particular storm is stationary, locked around the south pole. Also, Saturn has no oceans. Cassini will stay over Saturn’s south pole, observing the storm and how it behaves during different seasons on this majestic ringed planet. We all know of Jupiter’s Great Red Spot, but do you know about Red Spot Jr.? More importantly, did you know that astronomers observed its formation in 2000? 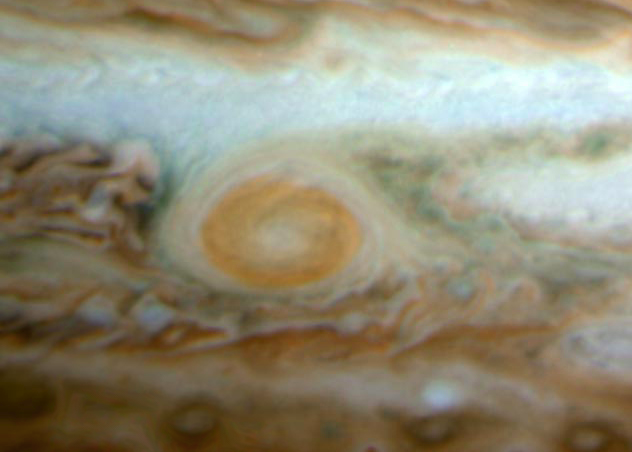 Over the course of several years, three smaller white spots, which had been around for decades, slowly merged into two spots and then into one, forming a single, giant storm, though not as giant as the Great Red Spot. After several years, the lesser white spot started to change color. Over the course of a month, it turned from white (November 2005) to a dull brown (December 2005). It fully turned to the well-known shade of brick red after several more months. 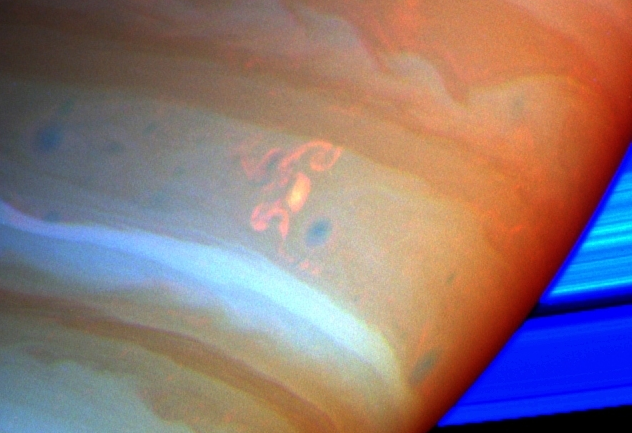 Though it is not yet known exactly how the spots change color, astronomers postulate that these storms drag material from the cloud layers beneath them up to the higher atmosphere, where they react with solar ultraviolet radiation and undergo some sort of chemical reaction to produce the color that we see today. Though color changes in Jovian white spots have been seen before, none have lasted as long as Oval Ba, meaning that we could have a real contender for a new Great Red Spot, which has already been going for over 300 years. So not only have we observed the incredible formation of Jupiter’s Little Red Spot, but also its color change and continuing growth into what may one day be Jupiter’s Greater Red Spot. 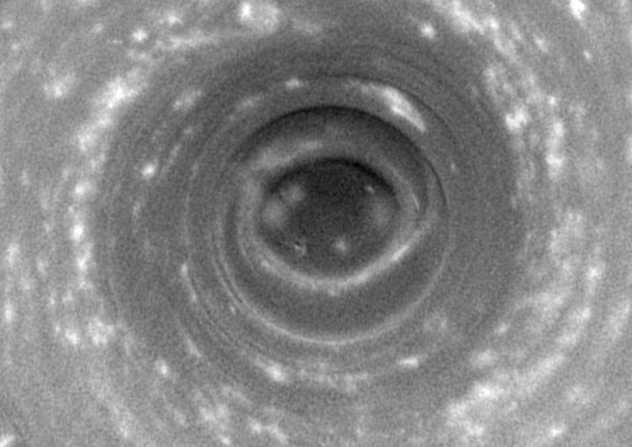 Perhaps the most stunning and mysterious vortex in the solar system, Saturn’s hexagon never fails to induce awe in those who gaze upon its majesty. Large enough to engulf four Earths and taking over 10 hours for one rotation, this enormous storm and its unusual shape beg for an explanation. Thankfully, science has the answer and has also been able to recreate the hexagonal phenomena in a lab. So how is this amazing storm formed and maintained? The storm lies in a sweet spot in Saturn’s atmosphere where there is a huge difference in the speed of the atmospheric winds. Saturn’s hexagon formed in an area of turbulent flow, where it was stuck between two rotating bodies of wind, both of which were rotating around the planet at different speeds. 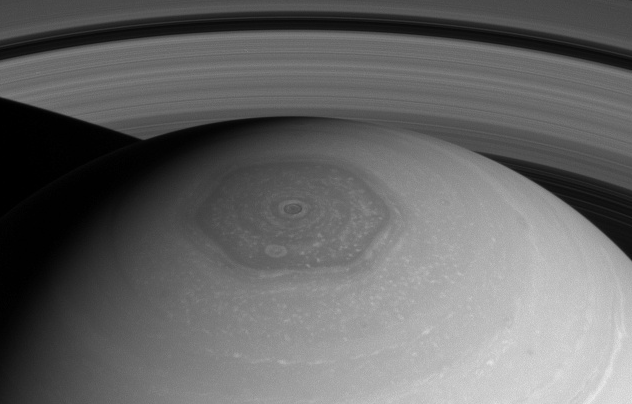 The vortex at the top of Saturn’s north pole (and inside the hexagon) is rotating at a different speed than the winds outside the hexagon, creating this stunning storm formation. Considering that the hexagon was observed in the 1980s and later revisited in 2006, it’s a safe assumption that it has been around for hundreds of years, making this a truly spectacular storm. The smaller, safer, and friendlier little brother of the tornado, dust devils are commonplace in the desert-like regions of our planet, but they are also found on Mars. It makes perfect sense when you think about it. After all, dust devils form in hot, calm, and dry environments when a small area of ground heats up faster than its surroundings, making Mars an ideal candidate for dust storms. These Martian dust devils are up to 10 times taller than our pitiful terrestrial equivalents, and some are even 50 times as wide, which could pose a threat to all the expensive rovers and probes that we constantly send up there. In a stroke of pure luck, however, these dust devils proved to be more help than hindrance when, back in 2005, a nearby dust devil blew an excessive amount of dust and debris off the solar panels of the Spirit rover, instantly boosting its power and allowing it to continue on its mission. Several Martian dust devils have been both photographed and filmed. Racing across the Neptunian surface at an insane 1,900 kilometers per hour (1,200 mph), this whippet of a storm is perfectly named Scooter and completes a circuit of the planet’s circumference in just 16 hours. 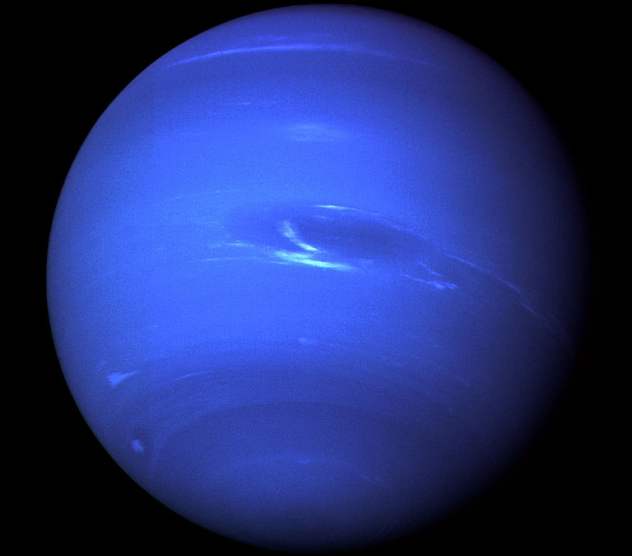 When you consider that Neptune is four times larger than Earth, that’s pretty impressive. Like the aforementioned Great Dark Spots, Scooter was observed by the Voyager missions back in 1989 and is photographed in the stunning image above. The photo shows three distinct images of the Great Dark Spot, The Wizard’s Eye, and Scooter. Astronomers really got lucky with this snap, as all three features orbit the planet at different speeds. To have them all in the same photo is a real jackpot. The origins of Scooter and why it’s so speedy currently remain a mystery, though astronomers speculate that the storm may be a rising plume from the lower atmosphere. My Name is Andy, and I like to write things. I write reviews for DeadPress.co.uk and 7BitArcade.com as well as dabble in a bit of satire over at Undergroundmgzn.com. I prefer gigs over clubs, whiskey over wine, and Christina Hendricks over any woman ever made, ever.